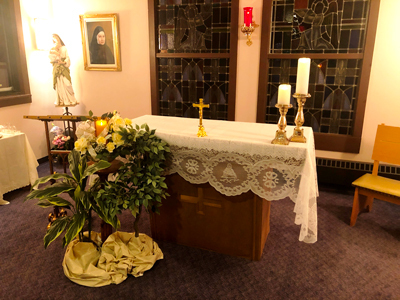 This entry was posted in Felicians, Franciscan feast, healing, Mercy, MINISTRY, reflections, sick and tagged Saint Louise de Marillac on March 15, 2019 by CSSF. 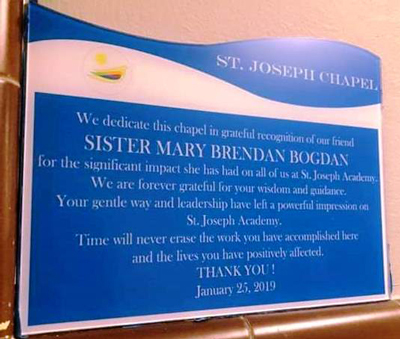 St. Joseph Academy in Milwaukee, WI, honored SM Brendan Bogdan, mission leader, on Friday, January 25, her 73rd birthday, together with the Felician Sisters who served and continue to serve at the school and early child care center, the second oldest corporately sponsored ministry of the Felician Sisters in North America. 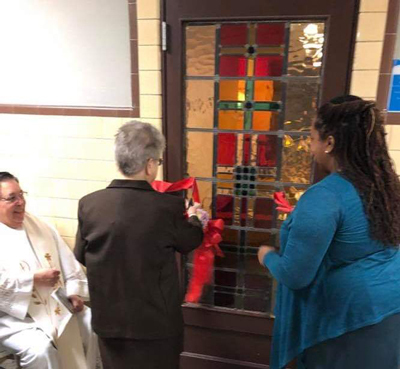 Father Luis Pacheco-Sanchez, honorary chaplain of SJA, led the prayer service that included a blessing, anointing, and dedication of the newly-refurbished chapel. 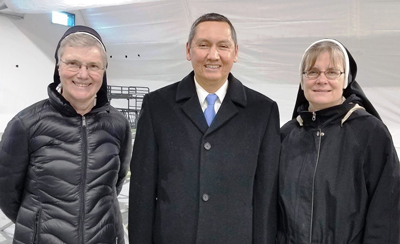 Approximately 50 participants, including Christina and Steve Jakupi, Sister Brendan’s sister and brother-in-law, braved frigid, below zero temperatures, to travel from Chicago, IL, to Milwaukee to participate in the evening service. for the significant impact she has had on all of us at St. Joseph Academy. We are forever grateful for your wisdom and guidance. and the lives you have positively affected. 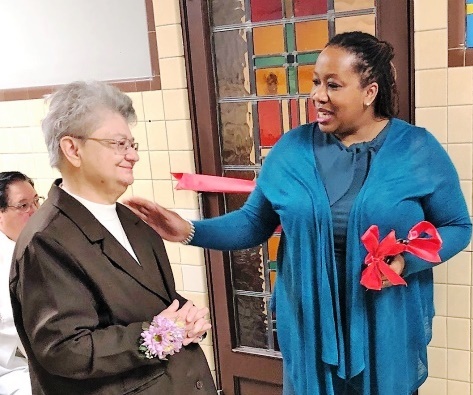 President/CEO Dr. Tabia Jones offered a welcome to the guests, Felician Services President Terry Schweizer and Dr. Thomas Kiely, SJA School Board Chairperson, offered congratulations to Sister Brendan. 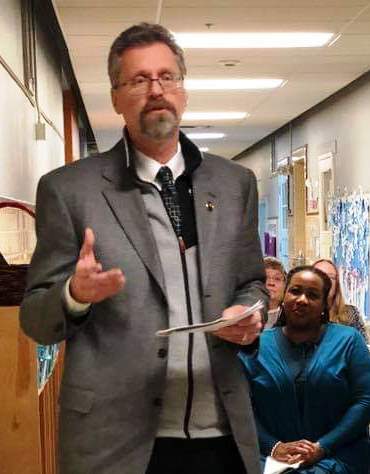 Principal Scott Hanson, Karrie Krueger, a director of the Early Child Care program, and Kim Schubring, resource development director, had roles in the prayer service, dedication and blessing developed by S Michelle Marie Konieczny, director of Faith Formation. 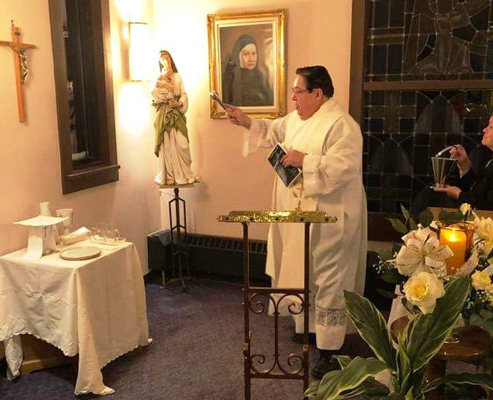 Two years ago, Sister Michelle conceived the idea of transforming the former meditation room and sacristy into a chapel where the Blessed Sacrament could be reserved, individual classes could share in Masses with Father Luis, and children and staff could visit and pray. She enlisted the guidance and assistance of Dr. Tabia Jones and Dr. Thomas Kiely and led a planning committee to keep the renewal “under wraps and a secret” until all was prepared. 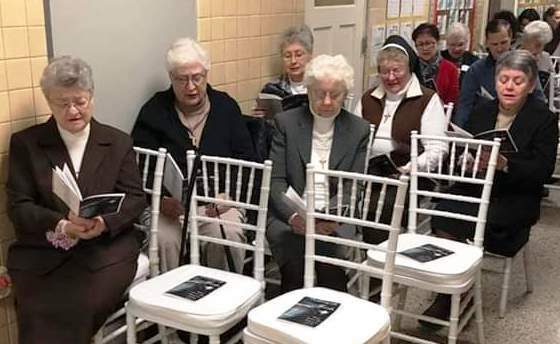 SM Ramona Dombrowski, SM Rosalie Disterhaft and SM Susan Holbach were present with, of course, Sister Brendan and Sister Michelle. Following the service, guests enjoyed cake and punch. 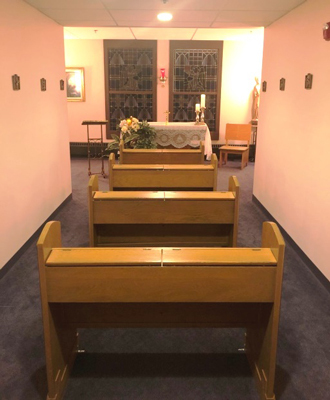 This entry was posted in Angela, Felicians, Gospel, healing, HUMAN DIGNITY, Jesus, Mercy, MINISTRY, vocations and tagged CHAPEL, DEDICATION, FELCIAN SISTERS, LEGACY, SISTER BRENDAN, ST JOSEPH ACADEMY on January 30, 2019 by CSSF. 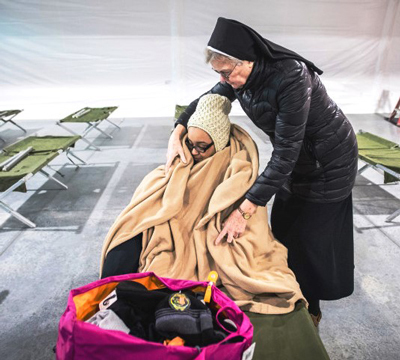 After months of waiting, the newly-built $10 million year-round homeless shelter in Pomona, CA, opened its doors to those who need a place to stay. 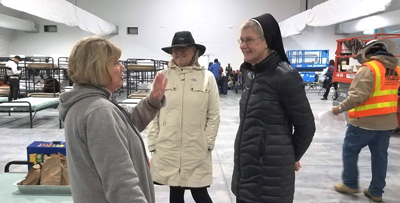 Sisters and volunteers from Angela Spirituality Center were on hand to welcome the first “pioneers” to the 16,000 square foot facility that is able to house more than 200 people. Just the day before, residents in the old facility were told that they would have to walk about a mile to the new shelter. But with the dawn came buckets of rain. So vans were called in to transport the group. S Maria Louise Edwards said, “Our volunteers were ready with sack lunches, warm clothing, and words of encouragement.” City of Pomona Mayor Tim Sandoval greeted everyone and personally thanked the Angela Spirituality Center for making a difference these past 10 years. 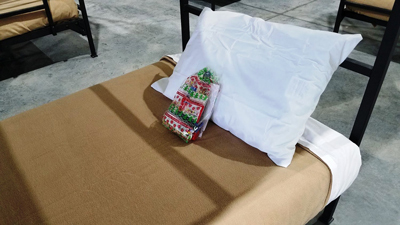 This entry was posted in Angela, Christmas, Church, equality, Fairness, Felician, Felicians, Gospel, healing, homeless, HUMAN DIGNITY, Jesus, Justice, Mercy, MINISTRY, NEGLECT, sick, Sister Mary Louise Edwards, CSSF on December 12, 2018 by CSSF.